The Ultimate Guide How To Use Trend Lines Like A Pro - Find the best Binary Options Brokers, Binary Options Bonuses, Binary Options Signals, Binary Options Software and everything Binary Options related on Binary Options Directory! Trend lines serve us to visually highlight the trend and they can be a part of many successful strategies. But unfortunately, out there exist a number of myths and inaccurate information about the trend lines. So I have decided to devote this article to "how effectively use the trend lines like a pro". The trend lines are a technical instrument which is used for defining price trends in most major financial markets. They have a great potential to alert us whenever pullbacks (movements against the trend) are about to end or before their reversal. Price is the ultimate indicator when using trend lines. Whenever a formation of two higs or of two bottoms occurs we can draw a trend line. This is done as a connection of one high to another high. The same goes for bottoms, so one bottom price to another bottom. If you are just starting with charting trend lines, try to draw as many of them as possible, in all directions. This procedure will help you with a determination of pullbacks, short term trends and long term trends. Quite often you might look at a price chart with the idea to make immediate predictions of the trends, but hold on for a second longer, they may not be entirely correct. When we force ourselves to make as many relative trend lines as possible, especially the ones on the right side of the chart (where is drawn the most recent price movement development), then we can realise that our initial estimate was 100% correct. The view on all trends and pullbacks of all sizes can help you to expand your horizons in the overall analysis and improve your existing reading chart skills. More knowledge and better predictions = increasing your profitability when trading binary options or forex. Services and programs on technical analysis differ, but all of them should have a tool to draw the trends lines or at least lines. Choose one such software. To draw the uptrend (a growing trend), connect the bottom of one price level to the bottom of another price. Consequently extend the curve to the right, so you could get a clearview of where the next bottom might appear. For drawing a downtrend (a falling trend) connect the top of one price level to the top of another price level. Again, be sure to extend the curve to the right, which is used for observation of possible future peaks. You will be very often forced to redraw your trend lines because it is not a perfect tool which would always tell you when the trend is about to reverse. So you will find yourself more than once drawing trend lines which connect highs or bottoms just to see that the next trend wave does not correspond with your trend line – either the price will not get to it or it will jump over it. In such cases, you need to decide whether the price level is anyhow relevant and if you want to redraw your trend line according to it. For long term trends, you will probably have to update your trend lines several times. Alternatively, you can decide to leave them on the chart, so you could see different phases of the trend along with the gradual behaviour (slow growth, sudden fluctuations in price levels, etc.). Trend channel is a connection between two parallel trends which serve us to illustrate the view of the occurrence of support and resistance. 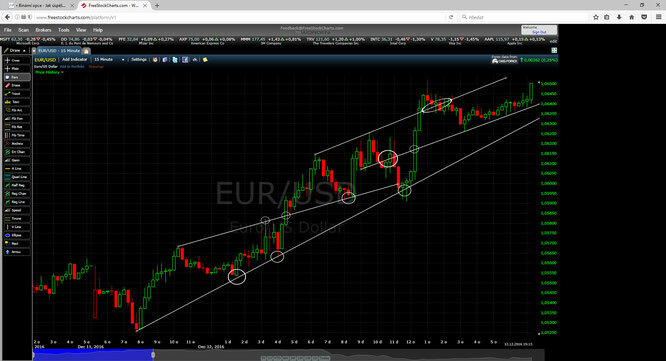 In order to draw a trend channel, connect bottoms to bottoms and highs to highs during uptrend or downtrend. Trend channels form uptrend (or downtrend) to more visible appearance and they offer clues to making a position. If the uptrend is approached by the price from the upper line of the trend channel, it may be a sign of a short-term market correction. 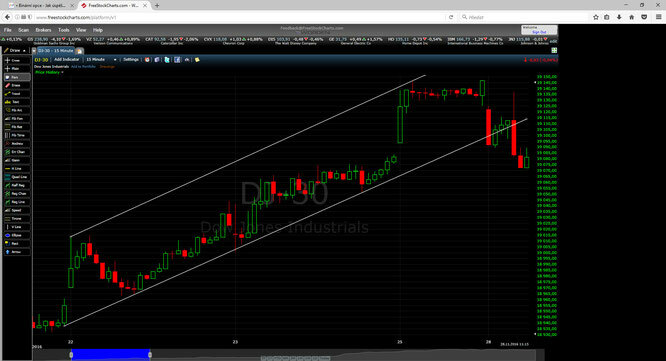 Breakouts above or below the trend channel may provide signals for the creation or termination of position. Trend lines help us to focus on trading in a direction of overall trend. Therefore when using these techniques avoid sideway markets. Trend lines are particularly suitable for trading assets, with a big trend tendencies. Saying "the trend is your friend“, is not said for nothing. But I still do not recommend using the trend lines as the only signal for your trades. Consider the usage of price action which works very well with the combinations of trend lines or another additional indicator.